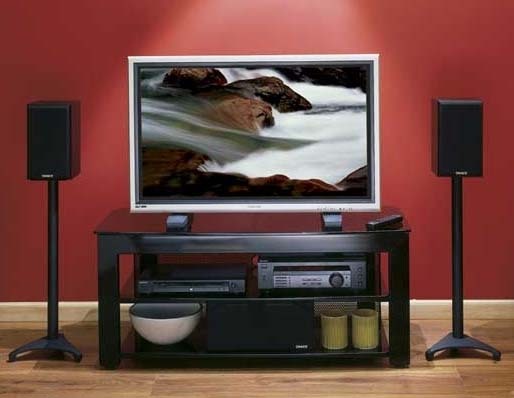 More on the Sanus Widescreen TV Stand for Screens up to 65 in. (Black) SFV49B below. The Sanus Steel AV Foundations SFV49 is a three-shelf AV stand featuring heavy-gauge steel construction and crisp, clean lines to create a modern, sophisticated look. Its tempered-glass top and shelves are extra-thick to support most any TV and AV component systems. Heavy-gauge steel construction for superior strength and durability. A durable, powder-coated black finish. Tempered-glass shelves provide durability and elegance. Flexible Positioning- top rear corners are angled to allow tight placement in corners. A hidden wire management path to keep cables neatly and safely out of the way. Perforated steel back-panels for a clean, finished look and convenient ventilation. Adjustable feet for level and secure positioning on any type of flooring. Click HERE for Instruction Manual!